Imaging is a useful resource for musculoskeletal conditions and is an invaluable tool for physical therapists when used appropriately. Imaging such as MRI, X-ray, CT scans, and bone scans are prime examples of practical diagnostic imaging that facilitates accurate diagnosis, prognosis, intervention, and assessment of injuries and dysfunctions that physical therapists' address on a daily basis. 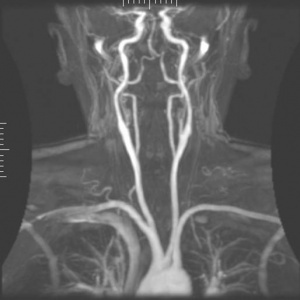 It is important to know when imaging is appropriate, as unnecessary imaging will squander financial resources and increase potential for premature surgery. In many cases, studies indicate diagnostic imaging is underutilized such as x-rays identifying fractures or bone scans identifying osteoporosis. There are also studies indicating over utilization of imaging, such as x-rays or MRI’s for acute and uncomplicated low back pain. 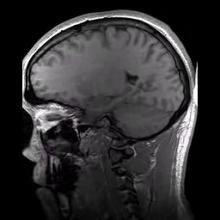 Magnetic Resonance Imaging (MRI) is a map of hydrogen atoms within the body. Hydrogen atoms are ideal for MRI because they possess a single proton and a large magnetic moment. The magnetic field created by the magnets causes resonance from each proton in the hydrogen atom and the machine is able to obtain the proton’s position. Since approximately 75% of our bodies are made of water molecules, MR imaging is able to capture precise and detailed images of the viewed body region. Thus, the MRI takes a detailed "picture" of all hydrogen molecules in the body and is computed into an accurate representation of that body region. 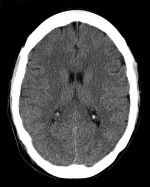 There are multiple types of MRI based on if the image is captured at a different decay of signal. A T1 weighted MRI captures early signal decay, that is, early after the protons are positioned. A T2 weighted MRI captures the late stage of signal decay, or after a small amount of proton migration from the original resonsance. Hybrid MRI Sequences occurs with manipulation to the type and frequency of radiofrequency and cause echoes. A gradient echo adds sensitivity or iron-complexes such as articular cartilage defects and hemorrhaging in muscle, but conversely decreases resolution on metal hardware (such as pins or screws) from a surgery. Spin echo adds the benefit of increased tissue contrast and better visualization of meniscal tears. Stimulated echo reduce interference of signal and therefore may be used to look at specific molecular movements within tissue. 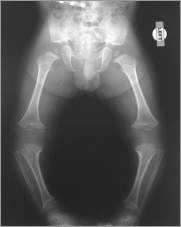 Radiography is the use of X-rays to view non-uniformly composed material. In the medical field, radiography is used to diagnose or treat patients through the recording of images of the internal structure of the body. These images assess the presence or absence of disease, foreign objects, and structural damage or anomaly. The term x-ray refers to the radiation beam and x-ray particles, not to the film plate itself. X-ray films should be referred to as films, plain films, radiographs, or a plain film study when dialoging within the medical community. Heel effect – a source of visual error related to x-ray production, due to the fact that x-rays released by the machine are not uniform. There are two ends to an x-ray machine, a cathode end and anode end. The cathode end releases more photons than the anode end, which results in over-exposure of the film at the cathode end and under-exposure at the anode end. Due to this fact, technicians will position the patient on the table in a manner such that the thickest portion of the body region being studied is placed nearest the cathode end of the tube and the thinner end is placed near the anode end. Artifact – An error in the perception of the visual image of the radiograph, usually seen as an abnormal finding or foreign body. Artifacts occur when the cassettes that house the x-ray film plates get exposed to finger prints or small debris. Exposure – A measure of the amount of ionizing radiation determined by 3 factors: time, x-ray energy, and the quantity of the x-ray photons. Exposure can be manipulated by the technician to highlight structures of interest. Over-penetration will tend to enhance bone visibility, while under-penetration will enhance soft tissue visibility. Movement – A blurring in the image as a result of movement by the patient the moment the x-ray exposure is made. Film processing – An error that occurs during the processing of the film can result in disturbances in the contrast, detail, or density of the image displayed. Caution to the radiograph viewer/interpreter – There is an inherent error that occurs when a 2-dimensional image is created to depict 3-dimensional structures that are often superimposed on one-another. 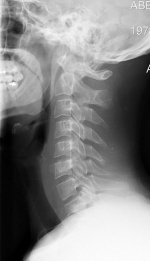 Due to this fact, radiographic studies of specific body regions often include 3 or more views from different angles. Enlargement occurs because the x-ray beams exit the machine in an expanding conical pattern (similar to a flashlight beam). As a result, objects placed closer to the beam source appear larger than objects placed further away from the beam source. Elongation is produced by the increased beam angle at the periphery of the x-ray beam cone. As a result of the increased beam angle, objects in the periphery of the x-ray beam appear smeared or spread compared to objects in the center of the beam. Foreshortening is the opposite effect of elongation. This occurs when the body region to be studied is placed at an angle to the primary x-ray beam, resulting in the appearance of decreased length. Superimposition occurs because anatomic structures are often stacked on one another, forcing the x-ray beam to penetrate multiple structures before arriving at the film plate. Superimposition can create the appearance of increased density of structures, or the appearance of novel structures altogether. Computed Tomography (CT) is an imaging technique that takes multiple x-rays from different angles and creates cross-sectional images of a body part. Cross-sectional slices are typically 1-3 mm thick, depending upon the type and location of the tissue. CT scans are primarily used for bony pathologies, but can also be used for soft tissue dysfunction. CT scans are not as effective at detecting soft tissue pathology as MRIs because there is not enough differentiation in the x-ray absorption of injured and healthy tissue. Other benefits of CT scans are that they are fast, relatively inexpensive and often a good alternative to MRIs if an MRI is contraindicated. Bone scan is an imaging technique that uses a radioactive compound to identify areas of healing within the bone. Bone scans work by drawing blood from the patient and tagging it with a bone seeking radiopharmaceutical. This radioactive compound emits gamma radiation. The blood is then returned to the patient intravenously. As the body begins its metabolic activity at the site of the injury, the blood tagged by the radioactive compound is absorbed at the bone and the gamma radiation at the site of the injury can be detected with an external gamma camera. A bone scan can be beneficial in determining injury to the bone within the first 24-48 hours of injury or when the displacement is too small to be detected by an x-ray or CT scan. Primary and metastatic bone neoplasms. Disease progression or response to therapy. Trauma – accidental and non-accidental. Bone viability (grafts, infarcts, osteonecrosis). Prosthetic joint loosening and infection. Pain of suspected musculoskeletal etiology. Complex regional pain syndrome (CRPS 1). Reflex sympathetic dystrophy. Abnormal radiographic or laboratory findings. Distribution of osteoblastic activity prior to administration of therapeutic radio-pharmaceuticals for treating bone pain. ↑ Van Tulder MW, Tuut M, Pennick V, Bombardier C, Assendelft WJJ. Quality of primary care guidelines for acute low back pain. Spine. 2004;29(17):E357-62. Available at: http://www.ncbi.nlm.nih.gov/pubmed/15534397. ↑ Freeborn DK, Shye D, Muttooty JP, Eraker S, Romeo J. Primary Care Physicians ’ Use of Lumbar Spine. Journal of General Internal Medicine.3-9. ↑ Carey TS, Garrett J, Back C, Project P. Patterns of Ordering Diagnostic Tests for Patients with Acute Low Back Pain. Medicine. 1996. ↑ 5.0 5.1 5.2 5.3 McMahon KL, Cowin G, Galloway G. Magnetic resonance imaging: the underlying principles. The Journal of orthopaedic and sports physical therapy. 2011;41(11):806-19. Available at: http://www.ncbi.nlm.nih.gov/pubmed/21654095. Accessed March 16, 2012. ↑ 6.0 6.1 6.2 6.3 Biederman, R. E., Wilmarth, M. A., & Editor, C. M. D. T. (n.d.). Diagnostic Imaging in Physical Therapy Avoiding the Pitfalls. Diagnostic Imaging. ↑ College A. ACR PRACTICE GUIDELINE FOR THE PERFORMANCE OF ADULT AND PEDIATRIC SKELETAL SCINTIGRAPHY ( BONE SCAN ). North. 2007:1-5.